Abby Scher is a sociologist and journalist who covers economic justice issues and the U.S. Right. Returning to New York to integrate such insights into her own life, Scher earned her Ph.D. in sociology from the New School University in 1995, then worked as a journalist and editor for publications addressing social and economic justice, setting in motion the events that would lead her to the ethnic side of the newspaper world. 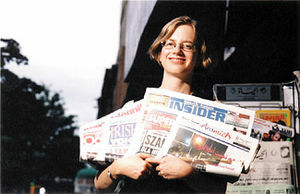 In 2000, Scher founded IPA-New York, associated with the national Independent Press Association (IPA). IPA works to promote and support independent publications "committed to social justice and a free press". As IPA-New York’s director, Scher provides technical assistance and information-sharing to a network of ethnic newspapers and magazines serving immigrant and low-income communities. Particularly valuable to independent journalists has been IPA-New York’s Independent Press Club, which Scher founded in 2001. The press club offers face-to-face access to newsmakers who might otherwise not return phone calls from small publications. Past IPC events have featured New York’s police commissioner and schools chancellor and the state attorney general. Access has been a major theme for Scher. After September 11, she created “Voices That Must Be Heard,” a weekly e-mail and Web publication that translates and presents the best of New York’s ethnic press to the rest of the city, and beyond. Through IPA, she has generated a group ad-placement service for the ethnic press that last year generated $600,000 for participating publications. Scher also launched a program that supports 14 Immigrant Press Fellows, to hone their knowledge of immigrant legal rights and other issues. Her concise, yet comprehensive study of the ethnic press of New York resulted in Many Voices, One City: The IPA Guide to the Ethnic Press, a 200-listing directory. A bridge-builder, Scher stimulates discourse across ethnic barriers, helping groups with long-standing animosities, such as Arabs and Jews, and Indians and Pakistanis, to work together on common problems. Scher says she will create new programs to strengthen the power of the ethnic press, expanding IPA’s editorial services, fostering more exchange among member publications’ editorial staffers, and creating jobs for under-employed immigrant journalists. She also intends to create a low-cost, nonprofit translation service to help unions, government agencies, and community organizations provide better outreach to immigrants. An even larger goal is the creation of an independent press bloc, linking ethnic publications with the nation’s few remaining independent mainstream dailies and weeklies. The objective: to provide an alternative to corporate news media. “We want to make our new immigrant press fellowship permanent,” Scher says, “to support civic reporting that inspires communities and builds their power.” On a personal note, she anticipates returning to her own journalistic roots, to edit a magazine addressing social justice issues and hiring writers from many of the communities she has helped to reach a wider audience. Abby Scher addressed the The Right in these Times: Understanding and Combating Contemporary Shifts to the Right, the Second Annual Conference On “Rightist Movements” Friday, May 1, 2009, The Graduate Center, City University of New York 365 Fifth Avenue. In March , Abby Scher addressed a panel at Left Forum 2011, Pace University New York. This page was last modified on 31 July 2016, at 21:32.